This is sometimes referred to as a spaghetti western, but it isn’t. 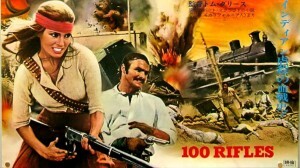 Although it was filmed in Spain like many spaghetti westerns and featured Italian actor Aldo Sambrell in the cast, it had an American director, writer, producer and most of the cast. In fact, there was a lot of American talent involved here. 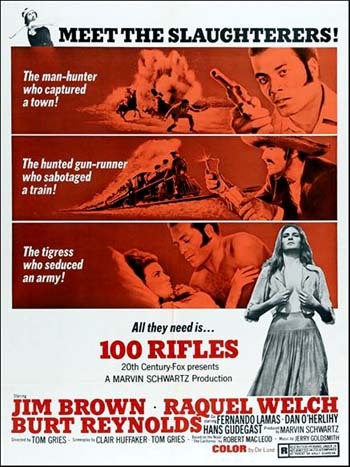 This was the second of director Tom Gries’ three westerns (along with Will Penny and Breakheart Pass). He also co-wrote the script, along with experienced screenwriter Claire Huffaker (The Comancheros, Rio Conchos). It has a very good musical score by Jerry Goldsmith. 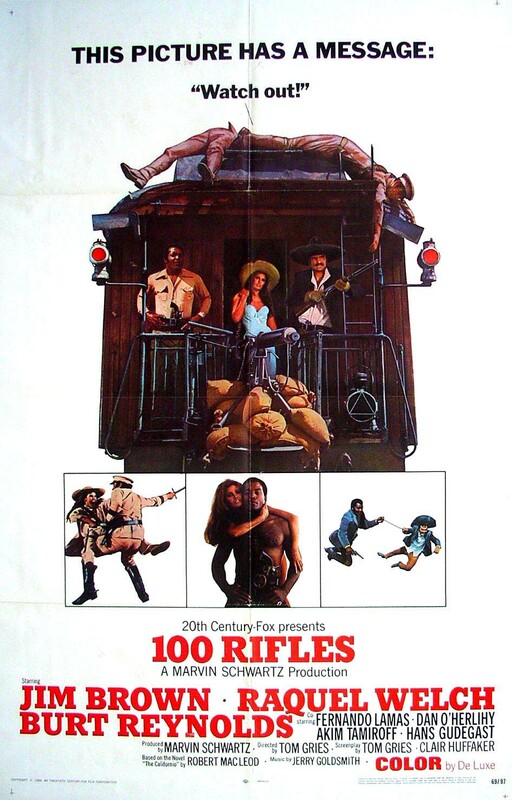 And it featured three stars who were either on the rise (Burt Reynolds, Jim Brown) or near their peaks (Raquel Welch, known more for her physical attributes than for acting ability, but she still had box office appeal). It gave Jim Brown, who had his start in movies with the western Rio Conchos five years earlier, a more substantial leading role than he had previously enjoyed in films. And it also gave U.S. audiences the first bi-racial love scene in a mainstream movie. It looks to be set in northern Mexico (specifically, in the state of Sonora) in the early 20th century, the era of continuous Mexican revolution, with trains, a few cars and a few modern armaments scattered around. Gen. Verdugo (Fernando Lamas), the official governor of Sonora, leads regular troops against the Yaqui Indians and rebels under Gen. Romero. 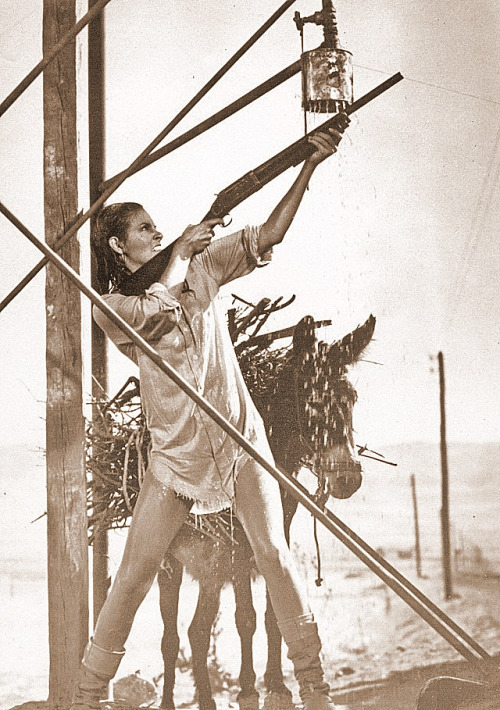 One of the Yaquis is Sarita (Raquel Welch), as in the opening scene we see Verdugo hang her father. Into town separately ride two Americans. One is Yaqui Joe Herrera (Burt Reynolds), only half Yaqui, who has just robbed a bank in Phoenix, Arizona, of $6,000. 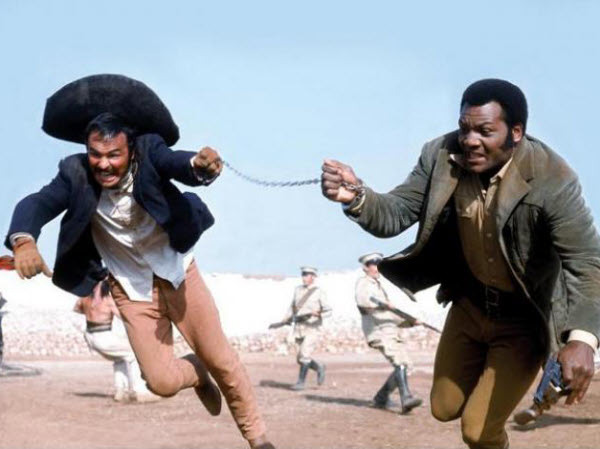 The other is Lyedecker (Jim Brown), a former buffalo soldier who has taken a temporary job as a peace officer and hopes to make it permanent by bringing in Joe. Verdugo is not minded to let any of the three go, but they escape together with Verdugo and his men in hot pursuit. Yaqui Joe (Burt Reynolds) and Lyedecker (Jim Brown) make a break for it. 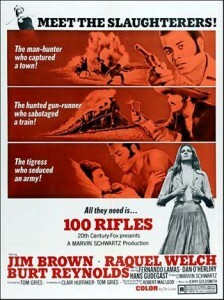 Joe has used the stolen money to buy the 100 rifles of the title for the desperate Yaquis. They recover the rifles on mules outside of town, fighting a rearguard action against Verdugo. Lyedecker develops a relationship (or at least a one-night stand) with Sarita. As they arrive in the town where they expect to turn the rifles over to Gen. Romero, they find that he has been killed the day before, and Lyedecker is hailed as the new general. He leads in the capture of an army train, although Verdugo wasn’t on it as they had hoped. Taking the train into Nogales, on the northern border of Mexico, for an attack on Verdugo’s forces there, Verdugo hears of their plan and is ready for the train. Lyedecker, Joe, Sarita and most of the Yaquis and rebels jump off before the train crashes into Nogales, and a battle ensues, with the Yaquis using captured weapons. Finally, Verdugo himself is clubbed to death with rifle butts, but Sarita is also killed. Lyedecker appoints Joe his successor as Yaqui/rebel general and heads back to the U.S.
Jim Brown would become a bigger star in the blaxploitation films and a few more westerns of the 1970s, developing (like Robert Mitchum) a sub-specialty in westerns featuring adventures in Mexico (this, Rio Conchos, Take a Hard Ride, etc.). He works well here, although Burt Reynolds does better. Raquel Welch does what’s required of her, with flaring nostrils to indicate a fiery temperament and putting her physique on display (a bit quaint by current cinematic standards). Welch is particularly effective in a scene that calls for her to distract a trainful of soldiers by taking a shower under a water tower. Pretty smoky for a mainstream 1969 movie, but she’s wearing a white shirt while doing it; nevertheless it works as intended. Reynolds and Welch did not get on well during the filming and would not work together again. The Lyedecker-Sarita relationship was daring for its time, but it seems unremarkable now and it does slow down the plot of a movie obviously based on action. The film seems like it could be tightened up to good effect. Sarita’s death off-screen in the final battle scene feels arbitrary, although clearly such things happen in battles like the one in Nogales. The movie’s not terrible, or even really bad, but the film’s present interest is more as a cinematic and cultural artifact of 1969 rather than because it’s a good western. In color, at 110 minutes. It was rated R on its release, because of all the violence and the steamy scenes with Raquel Welch. Somehow Jim Brown got lost on this Asian poster. 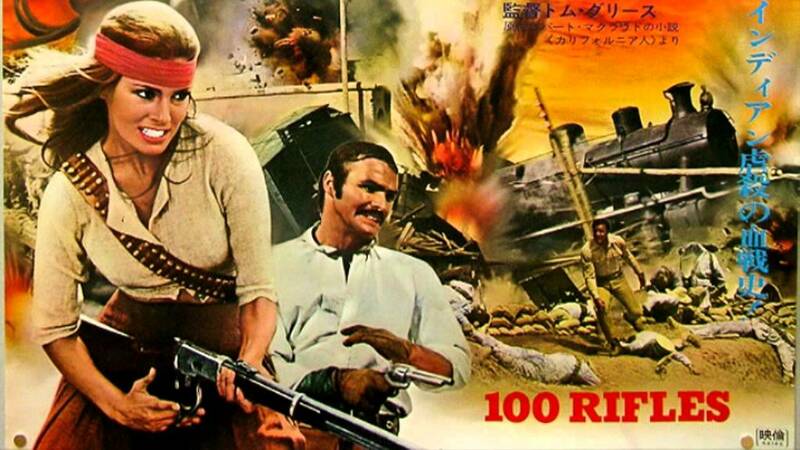 If you didn’t get enough Raquel Welch, see her in Bandolero! (adventuring in Mexico again, this time with James Stewart and Dean Martin) and in Hannie Caulder, a female revenge story. Burt Reynolds had already done the spaghetti western Navajo Joe, and would go on to appear in Sam Whiskey and The Man Who Loved Cat Dancing as he became a bigger star in the early 1970s. This entry was posted in More Westerns and tagged Adventures in Mexico, Burt Reynolds, Jim Brown on July 6, 2015 by Nicholas Chennault.